This easy glace icing recipe is great for cookie decorating. It’s vegan and made with no dairy and no egg whites. It also tastes great and dries hard. Some people have asked me about an egg- free royal icing recipe and that’s basically called GLACE ICING. This icing is PERFECT for people with egg allergies. YAY!!! It’s made with no meringue powder and no egg whites unlike my go-to royal icing recipe. It can also be dairy free, if you use almond milk, soy milk or coconut milk. It’s just that I like decorating cakes and cupcakes SOOOO much more that cookie decorating takes a back seat! But, every once in a while I get an itch to play around with cookies and just have fun. Unlike royal icing which is considered a little temperamental, this no fail glace icing recipe is DUMMY-PROOF. I am not even kidding… totally dummy-proof! lol. You just dump all the ingredients in a bowl, mix everything and start piping. Easy peezy! Cookies that are decorated with this icing have a SHINE to them unlike royal icing. So, if that’s something you don’t want…steer clear of glace icing and stick to royal icing. Just like royal icing, this icing can also be EASILY colored with gel colors. Also, I might be crazy but I think this icing takes a little LONGER to dry than royal icing. Anyways, I had some leftover heart shaped sugar cookies and decorated them with glace icing. That’s when a cookie is covered in icing and before it has a chance to dry, another layer of icing is applied to it. I made 2 designs… a swirly pattern and a simple polka dot pattern. The swirly one was my FAVORITE! Which one do you like more? This easy glace icing recipe is great for cookie decorating. It's vegan and made with no dairy and no egg whites. It also tastes great and dries hard. Mix everything with a spoon until everything is fully blended and you will end up with somewhat of a thick paste. I prefer using a hand held mixer or my KitchenAid to mix everything coz everything blends more properly. You can now divide the icing into separate containers and use gel colors to tint them. I usually let my icing sit for 15 minutes and then use it. You don’t have to wait and you can start piping immediately. 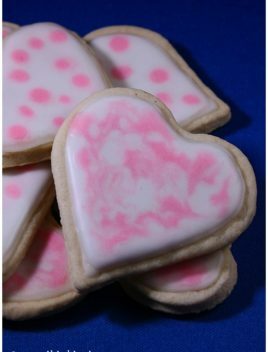 Use thick consistency white glace icing to make an outline around your heart cookie. Flood the inside of your cookie with thin consistency of white glace icing. For the polka dot pattern, use a small round tip to squeeze little dots inside your heart before the icing has a chance to set. For the swirly pattern, use a small round tip to squeeze little dots inside your heart cookie before the icing has a chance to set. Then, start moving your toothpick randomly through all the dots until your have lots of swirls. Enjoy! – This recipe yields about 2 cups of icing. I find the icing NOT to be as stiff as royal icing. – If your icing is too thin, you can make it thicker by adding more powdered sugar…1 tablespoon at a time and mix it thoroughly. – If your icing is too thick, you can thin it out by adding some milk… ½ teaspoon at a time and mix it thoroughly. – You can also use soy milk or almond milk or even coconut milk instead of whole milk, which makes this icing suitable for people with dairy allergies. – Store leftover icing in an airtight container in the fridge for up to 1 week. When you need to use it again, take your container out of the fridge and let it come to room temperature. You may have to mix it again in your mixer. – Cookies that are decorated with glace icing usually take about 12 hours to dry completely. Timing can vary depending on where you live and your weather conditions. Hi! Can I double the vanilla extract instead of using almond extract? You can either omit it or replace it whatever extract you like. Can I use the the liquid food colouring that is used to colour Easter eggs? If it is edible and food-safe, you can use that. Keep in mind that liquid food coloring will thin out this icing. That’s why I prefer gel food coloring. You can use it but I find the icing lacks the flavor and creaminess of whole milk. If you try it, let me know what you think.